Oh sorry I didnt see you there….. I am a pretty clumsy person, i often trip, run into people, and fall when I am walking around. It gets worse when you put a phone in my hand, I am the person that will walk into a glass door when I am texting. I do not text when i drive, I have learned quickly that that is not a good idea; and i think the population is catching on to this trend of not texting while driving. One thing that could affect safety and would make this situation worse would be interactive glasses. And guess what, Google is putting out smart eyewear by the end of the year. Glasses that you can wear and walk around streets, talking to yourself, finding out what is around you, and of course advertisements. In the past there have been many futuristic movies that use glasses like this or a screen over your face that tells you information……well its actually happening. Google thinks these glasses will become popular because it will free up your hands and give you all the information in your line of vision. I think it is a horrible idea, the fact that little blurbs of information are going to be popping up in your vision is a recipe for disaster. Google does not want people to wear these glasses constantly, but I could see the population taking this new technology and abusing it. If people are focusing on how to work their glasses, relying on the glasses for information, and entertained constantly they are likely to wear these glasses all the time. I do not know if these glasses will be successful but I do think other things like this are going to be developing in the next few years. I have heard about a helmet you wear when you are playing video games or watching movies to really immerse in the virtual world you are visiting. I am more supportive of these products because the people wearing them are not mobile, they are sitting in their house on their couch. I am curious to see how the technological world and eyewear companies will respond to this new innovative idea. This idea will affect social media, marketing, business, safety, and many other industries. 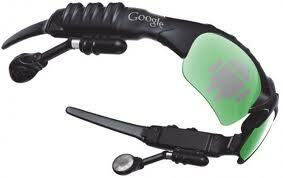 If you want to know more about these google glasses just google it!